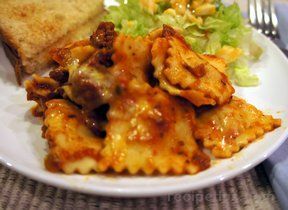 This recipe gives you an innovative, and easy way to present large ravioli- grilled right off your GrillGrates. 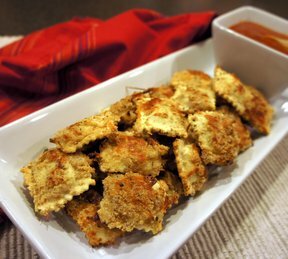 It is easy, delicious, and transforms the old ravioli into a light, crispy side dish or appetizer. Grilled ravioli is more like a puff pastry than a soggy boiled pasta. These can be purchased in the deli section of most groceries. Any ravioli filling will work! This is not a recipe that should be attempted without GrillGrate. Remove from package, handling carefully as the dough may stick together. 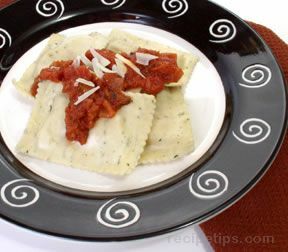 Place oiled ravioli on preheated GrillGrates (5-8 minutes) on Low-Low/Med heat, lid closed. For charcoal grill, wait until peak red hot coals cool to all gray before preheating GrillGrates. Grill pasta on Low, Low/Med heat with lid closed for 5 minutes on each side, turn with The GrateTool. NOTE: Judge the initial sear marks to get an indication of how hot you are cooking. If the sear marks are dark to black on the first flip, you are cooking too hot, turn down the burners.